We found this medium sized brown butterfly near a forest road. 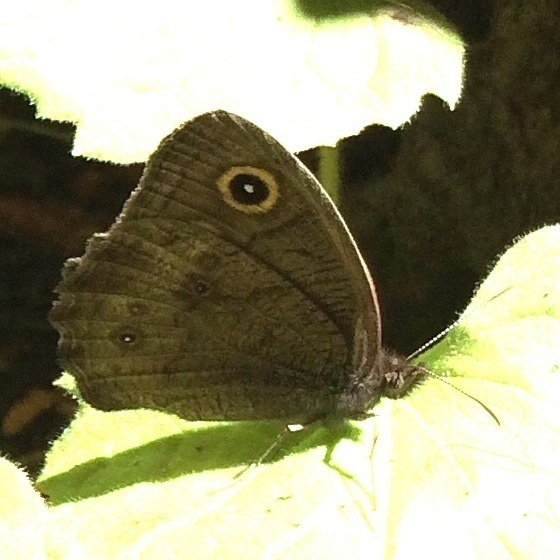 The butterfly's wings are a smooth grayish brown on the lower side, each with one obvious eyespot. It stayed calm in the deep shade as I took photos. (I had no flash and had to adjust the light of the photo for it to show up at all.) When we walked away it followed along and calmly flew with us as we walked. Its upper side was yellow with a brown spotted pattern, but it never opened its wings when it stopped.